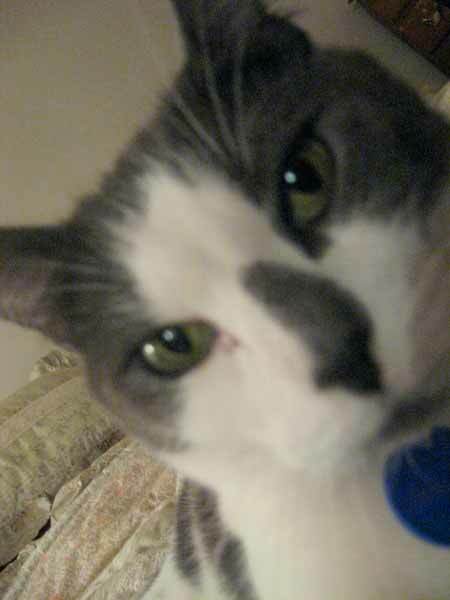 Frederik writes, "In September of 2005, I adopted a five year old cat, named Gabriel. He is a very beautiful cat, with blue eyes. He has soft, long hair, colored white, cream, and brown with a white tip on his tail. Overall, he is a gorgeous cat. "Now, he is doing very well, as you can see from the attached photos. 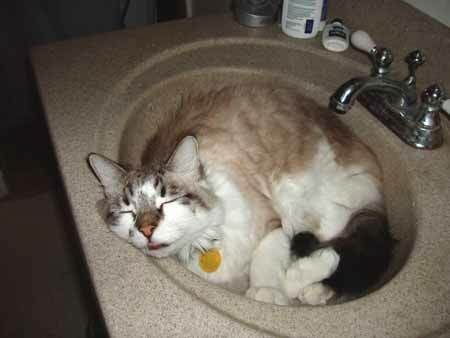 I was lucky to get a photo of him, in the bathroom sink, as it is not his usual sleeping place." 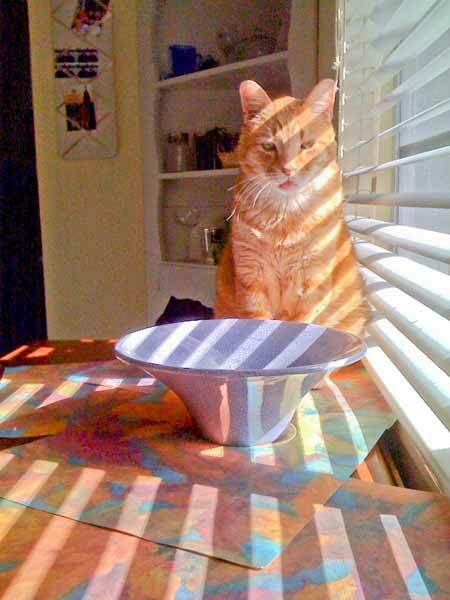 Debbie writes, "I adopted Rascal on October 25, 2008. It was a rough start with him. He was very scared and I was just to excited to have him. Finally, two days later after he had been hiding and not eating, he decided to come out and meet me. Oh my God, I can't tell you how much he has made me happy. He is so friendly and loving. He is still alittle scared, but not much. He runs up and down the hall. He also doesn't go running when people come over. He does come out and look around. "He follows me everywhere I go in the house, I love it that we have bonded. "I can't thank Kitty angels enough for giving me such joy." 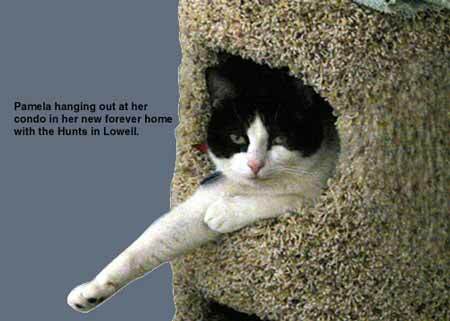 Rod writes, "I adopted "Maize" from Kitty Angels in January 2002; he was about three years old at the time. The attached picture was taken in December 2008. Maize still loves sunbathing, and continues to be a big "lap-hound". He is a wonderful companion." 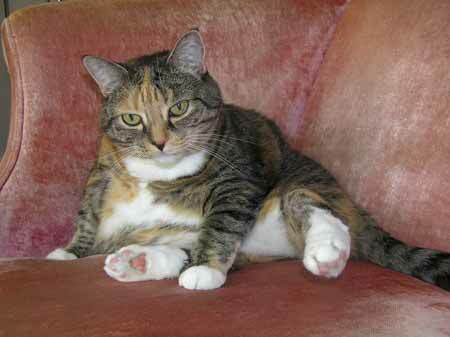 Mary writes, "I adopted Butterscotch in May 2007 when she was six and a half years old. When I opened the cage door and she climbed into my lab I knew she was the one I had to take home. Unfortunately, one year ago she was diagnosed with chronic renal failure and kidney stones. She made it through the first bout of a ureter stone and came home from my veterinary school, Tufts, where she is a spoiled princess and considers her morning fluids to be cuddle time! She is a wonderful kitty and I don't know what I'd do without her squeaking and purring at me every morning." 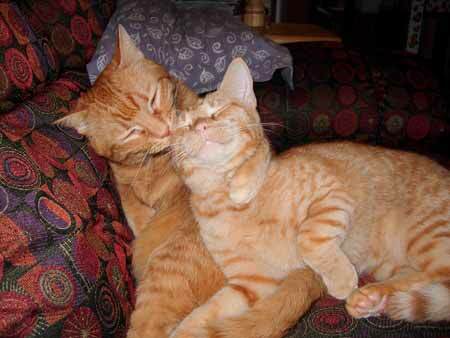 Nan and Bob write, "It must be all about The Orange -- we adopted Charles as a little brother to James, and they are indeed BFFs! James is amazingly affectionate and downright nurturing to us and to Charles; he has such a beautiful spirit that shines through, welcoming each newcomer to our home. He loves to help Mom with the laundry, and keeps her left arm firmly in place by draping over it when she's typing on her laptop. Charles is a sassy, independent, communicative kitten who lounges all over James (who, in turn, grooms him for long periods of time); he loves LapTime and being held more and more each day. We feel so blessed to have these two beautiful souls gracing our home, filling our house with purrs and bringing so much joy! We're so in love with both of them! Thank you, Kitty Angels." Pat and Richard write, "Pam was adopted in Jan. 2009. She has been a good addition to our family since the passing of our beloved Biancia. Being a feral she is more than shy but is learning our daily routines and accepting them. She is a good companion for Checkers as well. He now has a playmate but she rules playtime, which is most of the night. We've never had a cat with the energy she has. Think she's happy? We do. Thanks to Linda, she was saved from being returned to the feral community. "We encourage anyone considering a feline adoption to call Kitty Angels. We have three times and have no regrets. "